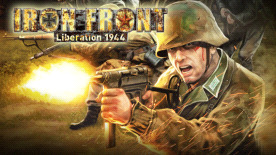 "D-Day" adds the famous landing on the coast of Normandy by the Allied Forces to the tactical World War II shooter "Iron Front – Liberation 1944". Merciless gun battles for each centimeter of the beaches await brave soldiers on the side of the Allies and the Wehrmacht alike in this extensive expansion. Brutal combat unfolds on the storm-lashed shores of France, as the future of the world is about to be decided at the Atlantic Wall... and you are in the thick of it! Fight with the Allied Forces against the dogged Wehrmacht defenders, or join the battle on the side of Germany and use any means to stop the Allies' advance. "D-Day" introduces a whole new scenario with new weapons, military equipment and missions in both single-player and multiplayer modes (incl. co-op), as well as the Allies as a new faction. In the expansion, players can take on the roles of American soldiers, pilots and tank crews to fight for the freedom of France. The famous landing craft which carried the US soldiers to the bloody battle of liberation at Omaha Beach are of course also included in D-Day. Air support is provided by the P-47 Thunderbolt, while Sherman tanks support the advance of the ground forces. Following the successful landing of the Allied Forces, the battles in Normandy continue with new missions featuring authentic re-creations of the military equipment of the age, including the Garand M1 rifle and the Browning automatic rifle. Players can also, for the first time, enter the war on the American side and use the new troops in multiplayer mode as well. However, the German troops are also well-prepared for D-Day: In response to frequent requests from the community, the Tiger I panzer is ready to deploy in the expansion.